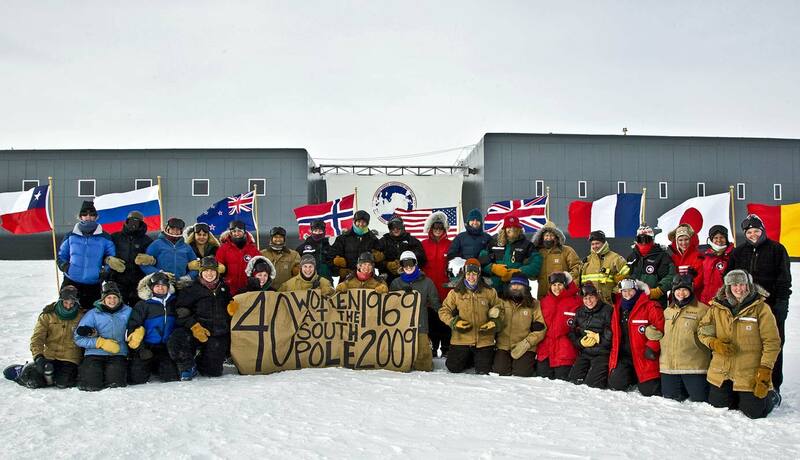 12 November 2009 marked the 40th anniversary of the first time any women set foot at the South Pole...and the event was marked by the above photo session of 33 of the many women who were on station (photo with complete list of names including those missing from the photo). The Navy, which managed most of the US Antarctic Research Program activities in the 1960s, resisted the idea of women researchers, until Lois Jones, a geologist at the Ohio State University, developed a project in the Dry Valleys that basically could not be refused for any rational reason. 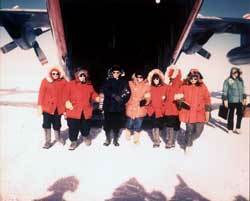 The members of this project, along with a Detroit News reporter, were the first 6 women to set foot at 90° South on 12 November 1969 (photo below). Here's my coverage of that 1969 event. The Antarctic Sun has a major special feature as well. The photo seen above is courtesy of the photographer Forest Banks. An interesting historical note...I heard from one of the 1969 winterovers, Jim Wallace, who said he was standing just to the left of the photographer taking the above photo. His comment, "We, the W/O crew, just wanted them to get the h*** out of the way so we could board and head back to the states!!"